Rejoice! New Bricklets are coming! In the last weeks we have been working on 11 new Bricklets. Below you can find the layout of the panel that is used for the first Bricklet production. In a second production we will use one panel per Bricklet. The new Bricklets are a Accelerometer Bricklet with 3-axis Accelerometer and a new Moisture Bricklet that uses a capacitive method to measure moisture (to avoid corrosion). The new Load Cell Bricklet can be used together with load cells to build custom scales. With the Laser Range Finder Bricklet it is possible to measure distances up to 40 meter with an accuracy of 1cm. The Bricklet can be used to measure a precise distance from a drone to the ground. Additionally we will offer a Industrial Dual Analog In Bricklet that is capable of measuring voltages very precisely. The new Analog In Bricklet on the other hand is a low-cost way to measure voltage. A new version of the Analog Out Bricklet will have the ability to create output voltages of up to 12V (instead of the maximum of 5V that the old Analog Out Bricklet could supply). An advanced version, the new Industrial Analog Out Bricklet is also available. It can produce 0-10V as well as 4-20mA output. Together with the Industrial Dual 0-20mA Bricklet it should now be possible to use all of the actors and sensors that are used in industry with 0-10V or 0-20mA interface. The Dust Detector Bricklet uses the Sharp GP2Y1010AU0F sensor. It measures the amount of dust that is present in the air. Another upgrade will be given to the Ambient Light Bricklet. The new version can measure illuminence much more precisely. With the RS232 Bricklet it is possible to talk to devices that use RS232 (for example to control a heating system). 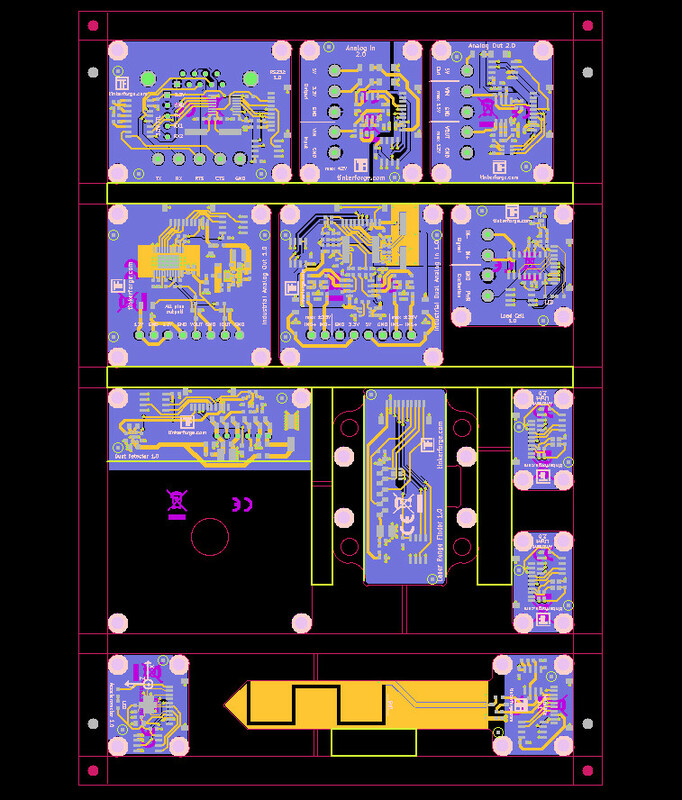 The circuit boards for the mass production are currently in production, they will be ready in approximately 3-4 weeks. There will also be even more hardware in the near future. Stay tuned! In the past we often had customers that asked us for suited motors and power supplies for our products. It wasn’t always easy for us to give good advice in that regard. 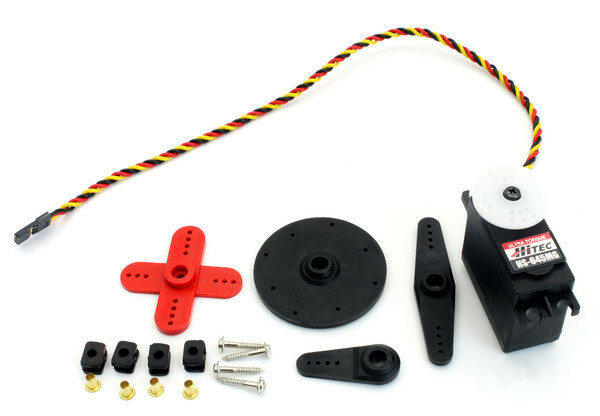 It did take a while, but we now have different stepper- and servo-motors, a 24V/4A power adapter and miscellaneous other accessories in our shop. The search for a suitable power adapter turned out to be pretty difficult. The power adapter should be able provide 24V with at least 4A. 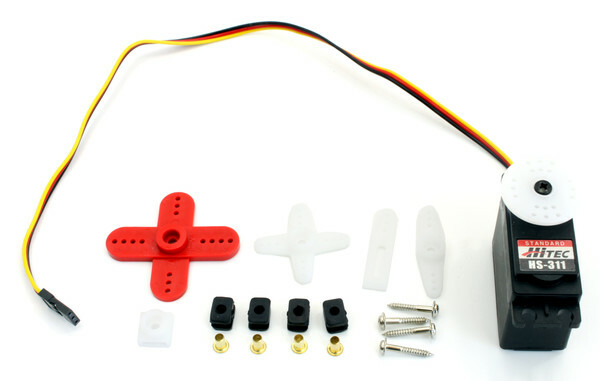 With this specification it is possible to power stepper motors as well as the Step-Down Power Supply. The Step-Down Power Supply has a maximum input voltage of 27V which is not exceeded by the 24V of the power supply. Another requirement was, that the power adapter is (out-of-the-box) usable with our standard black 2-pin connector. Most power supplies are only available with a barrel connector or as cable with center rail (24V) and outer insulation (GND). Both are not easy to use with our standard connector, we just need two stripped cable ends. In the end we did find a 24V/4A power adapter that is still affordable. 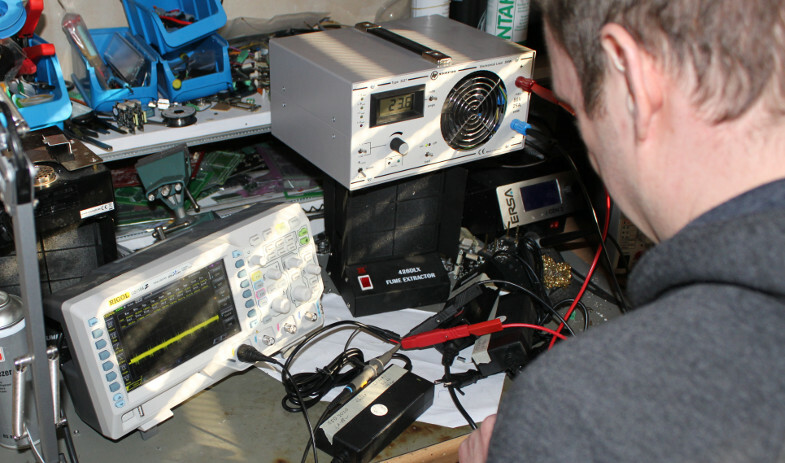 It had the most stable output voltage of all of the tested power supplies (+/- 500mV). It is short-circuit protected and it does not get super hot under full load. We ship the power adapter with two stripped cable ends. The cable ends can be inserted into our standard connector without any tools. 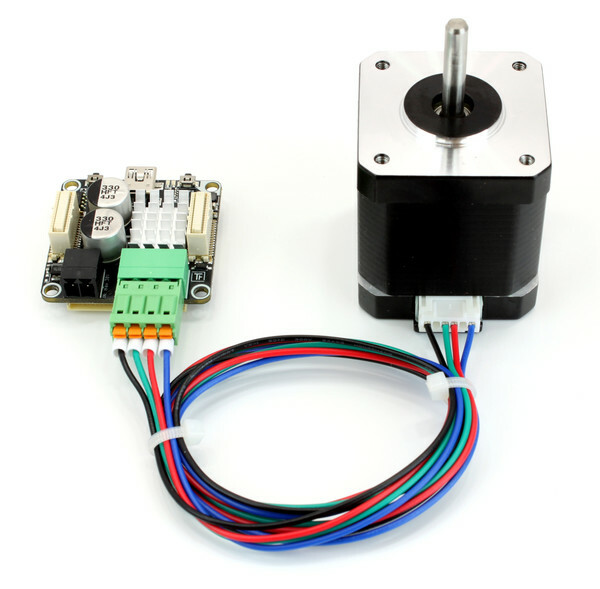 As a standard motor we offer a 200-step per revolution Nema 17 (42mmx42mm) stepper motor with a strong 0.43Nm torque and detachable cable. The motor can be used together with the above mentioned 24V power adapter and only uses a per-phase current of 0.85A to reach the maximum torque. This means that our Stepper Brick remains cool during operation, an external cooling is not necessary. The 5mm shaft of the stepper motor has a flat section, such that the shaft couplings can’t slip. As a second motor we have a 200-step Nema 17 stepper motor with high quality planetary gears with a gear reduction of 27:1. For a full revolution you need 5400 steps of the motor. The motor can reach a torque of 5.94Nm and it can thus be used in applications where precision and/or high strength is necessary. The 8mm shaft of the motor also has a flat section and it can be connected to a 5mm or 8mm shaft with the offered shaft couplings. 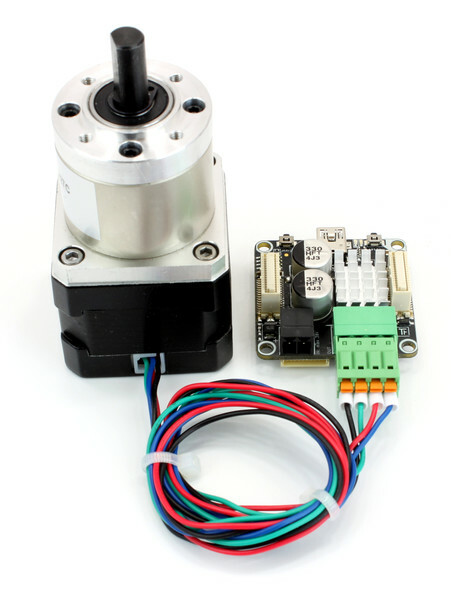 The HS-311 is a cheap standard servo with resign gears and torque of up to 35Ncm. The HS-645MG does have 96Ncm of torque and it uses metal gears. We will add more accessories to our shop in the future, stay tuned!